Do you know that Facebook keeps a record of everything you search on it? It has a database of every search query you have used on its search box. Shocked? You can see everything you have searched so far on Facebook to confirm. 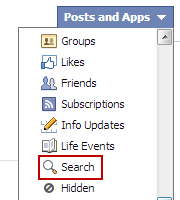 To view your search history on Facebook, go to your Facebook profile page and click on Activity Log link at top. On the Activity Log page, click on the drop down list of items in the top right corner that says, ‘Apps and Posts’. Select ‘search’ from this list of items. 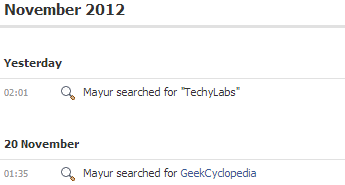 This will display all your searches on Facebook in the chronological order. Here you can see everything you have ever written in the Facebook search bar from the time you have created your Facebook account to the present day. This is a huge threat to your privacy. Facebook may decide to share your search history with advertisers in future. If you Facebook account gets hacked by any chance, this data may also get into wrong hands. Its best for your to delete Facebook search history from time to time. To delete Facebook search history, click on ‘Clear Searches’ button at the top. You can also selectively delete Facebook search history items one by one. To do this, you need to click on the small cross sign that appear when you hover over any Facebook search history item. That’s it. You now know how to delete Facebook search history and you can now decide to keep only the data that you want to share with Facebook. Update: Its now a known fact that Facebook uses the search history patterns of users to display relevant contextual advertisements. So if you delete Facebook search history, it may not be able to show you the ads that interest you. So if you want to see the ads based on your interests, you might want to keep the Facebook search history.